I love it. I have been eating petai (stink beans) for the past few days. Almost every Sunday morning, Ralph will buy a lot of petai from the market at TTDI (Taman Tun Dr Ismail). According to him, they are bigger and cheaper. At first, I refused to eat petai due to its strong smell is very pervasive. 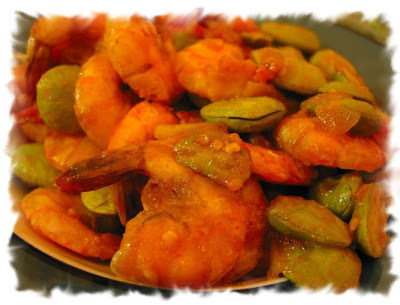 After he fried it with other strong flavoured foods such as garlic, onion, chile flake, and dried shrimp, as in "sambal petai", it is one of my favourite food! Petai contain three natural sugars -sucrose, fructose and glucose - combined with fiber, petai gives an instant, sustained and substantial boost of energy. Research has proved that just two servings of petai provide enough energy for a strenuous 90-minute workout. No wonder petai is the number one fruit with the world’s leading athletes. But energy is not the only way petai can help us keep fit. It can also help overcome or prevent a substantial number of illnesses and conditions, making it a must to add to our daily diet. High in iron, petai can stimulate the production of hemoglobin in the blood and so helps in cases of anemia. This unique tropical fruit is extremely high in potassium yet low in salt, making it the perfect to beat blood pressure. So much so, the US Food and Drug Administration has just allowed the petai industry to make official claims for the fruit’s ability to reduce the risk of blood pressure and stroke. Petai is high in B vitamins that help calm the nervous system. Overweight Studies at the Institute of Psychology in Austria found pressure at work leads to gorging on comfort food like chocolate and crisps. Looking at 5,000 hospital patients, researchers found the most obese were more likely to be in high-pressure jobs. The report concluded that, to avoid panic-induced food cravings, we need to control our blood sugar levels by snacking on high carbohydrate foods every two hours to keep levels steady. Many other cultures see petai as a “cooling” fruit that can lower both the physical and emotional temperature of expectant mothers. In hoiland, for example, pregnant women eat petai to ensure their baby is born with a cool temperature.